Campingplass Couleurs du Monde er en campingplass i Faverolles-sur-Cher, Loir-et-Cher. Denne campingplassen har steder med avgrensning, med skygge og plasser med noe skygge. Det er mulig å leie telt og stasjonære campingvogner. Campingplassen har lekeplass og idrettsplass. For sportslige feriegjester arrangerer campingplassen ulike sykkelturer. Det er trimrom. For dem som vil slappe av etter en travel dag er det sauna, boblebad, dampbad og skjønnhetssalong. Campingplassen har utendørs svømmebasseng, innendørs svømmebasseng med skyvetak og barnebasseng. Denne inspektøren besøker hvert år Campingplass Couleurs du Monde og inspiserer campingplassen for ca. 200 fasiliteter og for andre punkt som forekommer. Inspektøren er en medarbeider fra ACSI og arbeider ikke for campingplassen. We have used this site as a very convenient stopover on many journeys to and from the South. The site is beautifully kept with spacious flat pitches . It\'s location next door to Carrefour Market is great for stocking up and refuelling. The onsite restaurant serves fairly basic but good food at reasonable prices - very welcome after a long day. This is what we'd call a'proper' campsite. Very few mobile homes, incredibly friendly staff who took great care of the surroundings. There is a small farm, goats, chickens and sheep and the manager is happy for them to be fed the vegetable peelings. There weren't many toilets open when we were there but they were really clean. There's a Carrefour supermarket just outside the gate so shopping was never a problem. Montrichard is a 20 minute walk away and is well worth a visit. There are also lots of bars and restaurants to choose. The pool is also clean and tidy, unfortunately one of our visits were spoiled by five kids and an inflatable, but would we go back again for a couple of nights - yes. Pitches are a good size and mostly level. Having stayed here for 4 nights we found the constant traffic noise from the D976 which runs past the campsite extremely annoying. Will not return as there are other sites in the area which would be quieter. This is a lovely, friendly, family run campsite. Our first impression was the pretty surroundings. You are surrounded with flowers that are carefully tended. There is a Carrefour supermarket right next door. Having stayed in campsites nearer the Loire, we chose this as a base so we could explore other villages. Montrichard is just about 1 mile from the site. The campsite is clean, the showers and toilets are cleaned thoroughly. What we particularly liked about the site was the friendliness of the type of people who seem to choose a site like this. We would certainly recommend this site to anyone and we would happily come here again. Lovely site, beautiful flowers everywhere. Staff friendly & helpful. Level pitches. Covered pool okay, mostly shallow, probably would be too small in high season during school holidays. Restaurant/snack bar food fairly basic but ok. Great book exchange. Carrefour supermarket next door, don't even need to cross a road. Wifi okay but not free. Unisex facilities fine, they actually had toilet paper and seat, washbasins and soap (not often supplied on French sites!) and even loo seat covers ! 15 min stroll into Monte Richard, shop opening times very hit & miss. A beautiful, immaculate site, very well kept with lots of flowers everywhere. Large pitches, excellent toilet/shower facilities. The swimming pool area is one of the best I've ever experienced, a lovely temperature and spotlessly clean. There's a well stocked supermarket next door and although the site is on a roundabout, there's very little traffic noise. Reception is very well stocked with information and there's a great little bar with food available. We were here early June so it was blissfully quiet but the site was fully operational. A 10 minute walk from Montrichard. A delightful site, with spacious open pitches. Excellent toilet facilities and covered heated swimming pool. Very helpful and friendly staff. Large super market 5 min walk from site. Interesting town across river bridge 15 min walk away. An excellent center for the Loire Chateaux. Easy day's drive to Cherbourg for evening ferry. Thoroughly recommend for 1/2 nights or much longer stay. This is a very nice, well laid out campsite within walking distance of the interesting town of Montrichard. It is by a roundabout so there is some traffic noise, but it is also within easy walking distance of a supermarket which we found very convenient. The pitches are a good size, but be careful if you are there in the Spring not to park under the tree with the yellow sticky pollen (which we did). The bar was open in April. The restaurant was shut but you could order pizzas made to order. The staff were very friendly and helpful and spoke good English. The site has a clean, well-maintained sanitary block. There wasn't much dog walking on the site and none at all directly from the site, other than walking to the town. This is certainly a good stopover site for a day or two and a good base for visiting the eastern Loire area. A very good overnight site with ample facilities still open late in the season. We would have stayed longer if time permitted. Well run site with very friendly staff. A warm welcome when we arrived. Lovely indoor heated pool, spotless toilets and showers. Roads a little 'boggy' after rain but grass kept short. Adjacent excellent supermarket. Stayed here twice this year, will return. Vil du booke campingplassen Campingplass Couleurs du Monde eller få mer informasjon? Det går bra med opplysningene nedenfor eller via campingplassens nettsted. 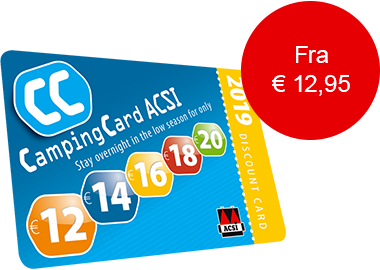 ACSI Eurocampings sender din forespørsel til "Campingplass Couleurs du Monde".